Please take the time to read this carefully as we explain our approach to sizing on our leather clothing and how best to choose which size to order. This is particularly important since most of our leather clothing is styled as ‘close-fitting’. And remember: if you need any help, please do contact us – we are only a phone-call or e-mail away! As you have probably already know, buying clothing on-line is not always easy, particularly when it comes to getting the right size. Receiving something that does not fit you, whether it’s too tight or too large, is disappointing. You then have to go to the trouble of returning or exchanging items and all this takes up your valuable time as well. We, at Tout Ensemble, care about our customers and don’t want to just send things out to you – as far as possible, we want to help you get your right size first time and thereby reduce the need for returns and exchanges as much as possible. The main reason that buying clothing on-line can be difficult is because UK sizes are often inconsistent and confusing – between stores, between different brands and and even different styles of clothing. How many of us have found that one skirt fits us in, say, a UK size 12, and then another time we have to buy a different style in a size 14? Or a ‘L’ in one jacket or waistcoat fits you, whereas you need a ‘XL’ in another? ‘Vanity Sizing’ or ‘Sizing Reduction’ are two stealth-like operations also conducted by High Street retailers to make us all feel a size or two smaller when we buy their products. Over recent years, manufacturers and High Street stores have altered traditional sizing to cater for the ‘expanding’ waistline and changing body shape. This make us feel slimmer than we really are. For example, today’s size 14 is yesterday’s size 16. Our leather clothing is usually styled as ‘fitted’, meaning that the garment will fit ‘close’ to your skin. These garments therefore need accurate measurements, especially as leather will not have any significant stretch. Our clothing is based on the ‘traditional sizing method’, so that, for instance, our women’s clothing has a 8-10in (20-25cm) difference between waist and hips. Our sizing is simple! We give sizes for all of our leather clothing as actual body measurements, i.e. Bust or Chest, Waist, Hips, appropriate to the particular garment. This means, of course, that you need to measure yourself before you place an order to check which size you need (see below ‘How to Take Your Measurements’). Now, if you are anything like the majority of us, either you have never measured yourself or you have not measured yourself for some time, and when you do measure yourself, you may be shocked to discover that you are not the size you thought you are or used to be! iii) measure another garment from our wardrobe. However, for all the reasons we have already given, all of these are likely to be inaccurate. Measuring another garment from your wardrobe can sometimes work, but is often not a good idea as this could be a different shape and style from the one you want to order. Therefore, we beg you to ignore any fear and trepidation and get out the tape measure! This is the only way of getting an accurate up-to-date measurement. Are you buying for someone else? We understand that if you are wanting to buy a surprise gift for someone else, it is sometimes difficult to get precise body measurements without giving the game away. Please contact us and we will do our best to advise! 2. It is often a good idea to have a friend help you, as it can be a bit awkward to do it yourself accurately. 3. Measure yourself in a relaxed state, e.g. don’t hold your stomach in if you are measuring your waist. 5. Do not pull the tape measure too tightly! Bust (Women) – Wrap the tape measure around the fullest part of your bust. Chest (Men) – Wrap the tape measure under your armpits around the largest part of your chest. The tape measure should wrap across your shoulder blades. Waist – Find the bottom of your ribs and the top of your hips. Wrap a tape measure around your waist midway between these points. Typically, your waist is the narrowest part of your waistline at or just above your navel. Hips – This is the widest part of your hips, across the hip bone, including your bottom. Wrap the tape measure around the largest area of your hips, this is usually around your buttocks. Our skirts and trousers are based on the traditional waist-to-hip ratio where the hip measurement is 8-10 in (20-25cm) bigger than the waist measurement. We put the waist and hip measurements for these garments, e.g. waist/hips 28in/37in (or 71cm/94cm). Some women will have a waist-to-hip ratio that is less than this. 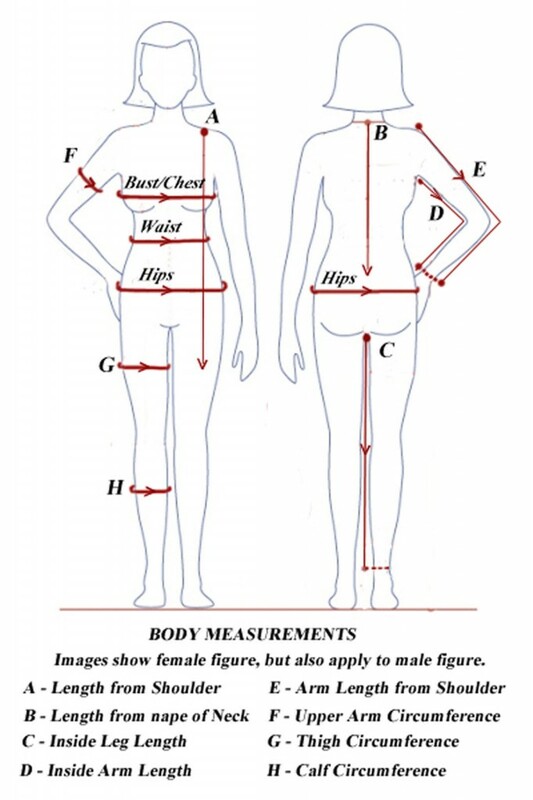 In other words, if the waist measures 28cm (71cm), the hips will measure less than 37in (94cm), or if the hips measure 37in (94cm), the waist measurement will be more than 28in (71cm). Our mens waistcoats, gilets and shirts are styled with a snug ‘vest-like’ fit. This means that if you have a rather ‘portly’ figure where your waist is larger than your chest measurement, the waistcoat or shirt may not fasten easily. Of course, they can be worn unfastened. Indeed, leather waistcoats are most often worn open for a more casual look and look great and you may wear the shirt open over a tee-shirt so it is more like a jacket. (Choosing a larger chest size to compensate for a larger waist-line may not be appropriate as the fit at the shoulder may then be too baggy.) Please feel free to contact us for any help or advice. We also give other measurements in the Product Description of some clothing items, e.g. inside leg, length from nape of neck. For your information, we have also marked these on the Body Measurements Diagram above. Expert tailors of more than 30 years’ experience can provide an alteration and bespoke (‘made to measure’) service on our behalf. Please contact us for further details. Read our description of gloves sizing. See also our Diagram below that illustrates these measurements. Many of our gloves are ‘One Size’, so no problem in choosing the size here! Others are sized according to the palm circumference, i.e. 6½in (16.5cm), 7in (17.75cm), 7½in (19cm), 8in (20.25cm). Dents and Pia Rossini ‘One Size’ gloves are manufactured to ‘World Standard Average Sizings’ to fit palm circumferences ranging between 6½in-8in (16.5cm-20.25cm). Please help us to help you by informing us if you think you may have fingers, hands or arms which are very much smaller or larger than the average, especially if you have had difficulty finding gloves to fit you in the past. This will prevent returns, postage costs and delivery delays. ii) the length from the tip of the middle finger to the top (cuff) of the glove. Since manufacturers differ somewhat in the measurements they use and the classification of their sizing, we have done our best to inform you of these sizes as body measurements rather than the manufacturer’s UK sizes or just simply as Small (S), Medium (M), Large (L), etc. In the meantime, if you are in any doubt, please contact us and we will be pleased to help. For Full (Closed) Shoes and Boots: It is often more appropriate to select the USA size 3 times larger than your own UK size (i.e. if you are a normal UK size 4 (length and width), then choose USA size 7). For all Open Toe Footwear (Sandals and Slides): It is often more appropriate to choose the USA size 2 times larger than your own UK size (i.e. if you are a normal UK size 4 (length and width), then choose USA size 6). We have given measurements for Thigh Circumference and Calf Circumference for our boots. For your information, we have shown these as ‘G’ and ‘H’ on the Body Measurements Diagram above so you can see where to measure these on yourself before ordering to check that the boots will fit your legs.